olive oil – Wait…are those…cookies?! There is something so soothing about early morning baking. I don’t necessarily choose to bake at 6:30a, but when a workout and work have to happen before I can deliver & eat dessert, baking by necessity becomes an early morning activity. That being said, though, it’s a very meditative way to spend a morning, especially when it’s still dark outside. Of course, then of course there’s that moment when you go to put socks on and somehow find some crystallized ginger stuck to your foot… um… no comment. It also gives me a great sense of productivity to know I’ve created something before I even leave the house that day – and then add a workout and a highly productive work day and by 6p I feel extraordinary accomplished. And THEN I get to eat cake! Ha. Win win, all around. Besides, coming back into my apartment after work, I’m greeted with a waft of OMG THIS CAKE SMELLS AMAZING – always a good sign. 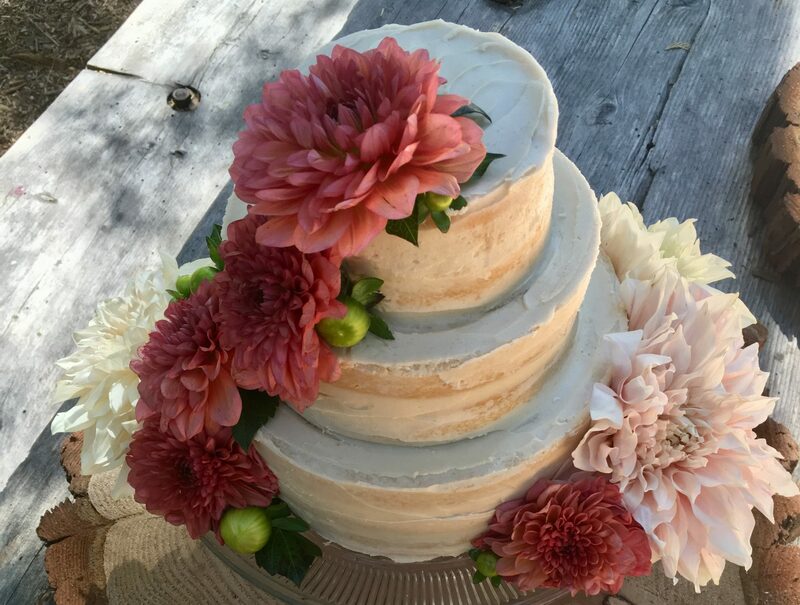 This cake was well loved by both of us – it is definitely going on the to-make-again list – and I have high standards for that list! The cornmeal/polenta give it great texture – it’s a cross somewhere between cake and cornbread, in the best way possible. 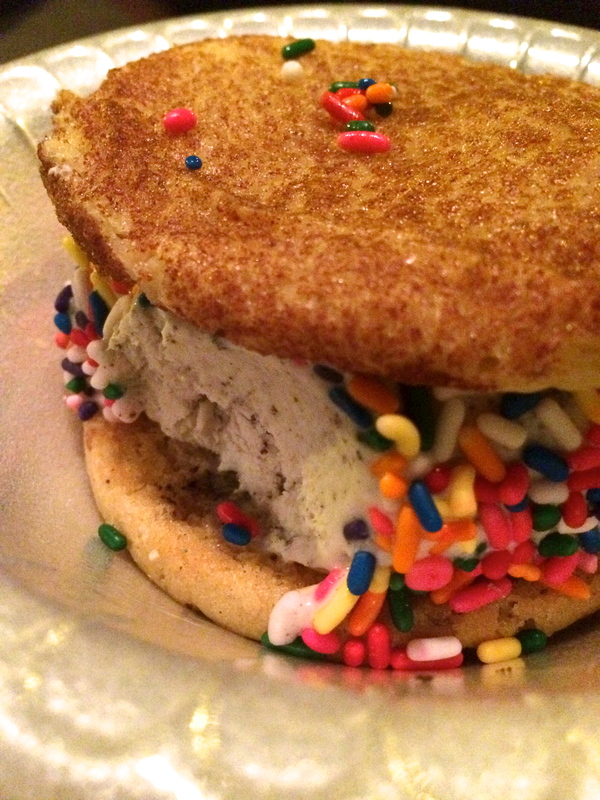 It’s amazing with ice cream for dessert, and equally so alongside eggs and kale for breakfast – see exhibit A below. No crumbs. One (large) slice left – that is after a stint of very productive yard work & leaf raking – that cake had NO chance. I can’t believe it’s already November. What happened to October?! Happy autumn! Gluten free, refined sugar free, and dairy free. Lightly sweet, sort of like a cross between cake and cornbread – perfect for dessert (served with ice cream!) and breakfast alongside eggs and leafy green things. Yield: 1 8″ cake, serves… um… 2! Ha. Preheat the oven to 350, and line an 8″ cake pan with parchment paper, or do like I did and use strips of parchment paper for easy removal. Be sure to grease the pan first though to prevent any stickage. In a large bowl, whisk the eggs with the maple sugar and maple syrup until soft and fluffy. Add in olive oil and vanilla. In a smaller bowl, whisk together almond flour, polenta, rice flour, and baking powder. Stir dry into wet. Cut one and a half apples into cubes and thinly slice remaining half. Add the apple cubes and chopped ginger and stir until just combined. Pour the cake batter into the prepared pan, and smooth it out a bit. Arrange a few apple slices on top of the cake, sprinkle with a bit of maple (or coconut) sugar. Bake at 350F for 40 minutes. Check the cake after 35 minutes; mine was perfect at 40. If the top of the cake is browning too quickly during baking, you can always tent it with a sheet of tinfoil. I stuck mine in the fridge for a few hours of storage, which didn’t hurt it at all. It keeps well on the counter overnight (covered with foil), and makes a ridiculously amazing addition to breakfast the next day! Happy New Year! Here’s hoping 2017 treats everyone a little better than last year – 2016 was a rough one for many. But as they say, onward and upward! Preferably with cake, which is where I come in. The dead bananas are calling! I had a plethora lurking around my kitchen this weekend and they put me on notice that they really wanted to reincarnate into something amazing… not banana bread again, if you please (my bananas can get a little demanding sometimes…). That being said, I had a hankering for banana cake (fundamentally different from banana bread, you see), so THIS happened! Happily so. Have you ever had sautéed dates? No? Get into the kitchen immediately and make them! I love dates anyway, but they are mindblowingly good when given a little bath in some olive oil and sea salt. I’ve always been a salt monster, so salty-sweet desserts are absolutely my jam, and these little powerhouses deliver. Besides that, they’re full of good nutrients (dates are high in vit A & K, plus potassium, calcium, phosphorus, magnesium & zinc. woohoo!). This cake is actually full of good things – you have healthy fats from almond flour, hazelnuts, and coconut, and all the good stuff in dates. And besides that, most critically: it’s delicious, which is good for your soul. More drawings, of course! New year, same series! This is the Havens Mansion, built 1884 on S. Van Ness in SF. My first activity of 2017! Shocked? Nope. Show your new and improved 2017 self some love with some sautéed dates atop your cake, and revel in all the possibilities of a new year. Onward! Pretty freaking amazing, if I do say so! Lightly sweet banana cake with jewel-like date pieces, coconut frosting and OMG sautéed dates, please make them immediately. 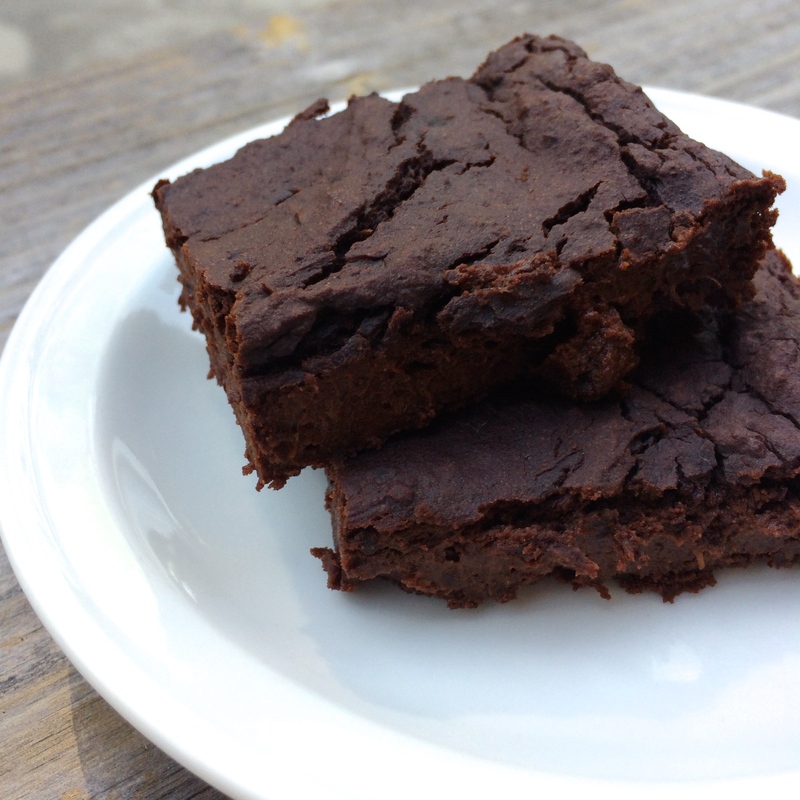 Serve with a bit of ice cream or non-dairy biz if that’s your jam! Can’t miss either way. 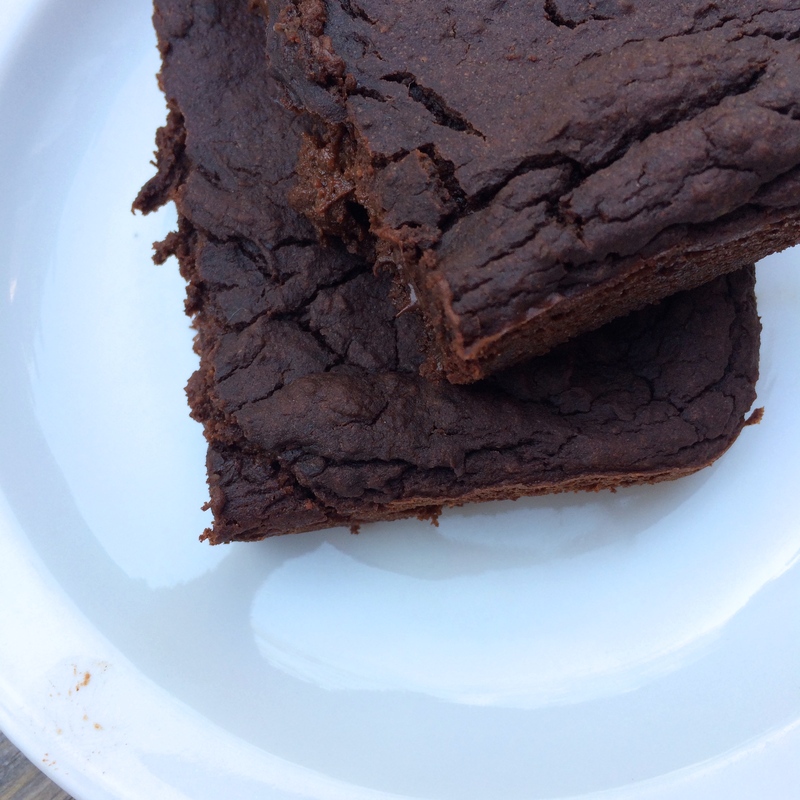 Refined sugar free, grain free, gluten free, dairy free, pretty much paleo. Yield: 1 8″ skillet cake, enough frosting to frost the top (cake is served straight out of the skillet); extra hazelnuts because you’ll definitely want extras… and the amount of dates is up to you (make extra!). Skillet cake adapted from Confessions of a Confectionista, here! I usually make the hazelnuts ahead and store them in a jar until needed. Remove most of the skins from the hazelnuts by rubbing them together; it doesn’t matter if there are skins left, but I try to get rid of the majority. Heat an empty saute pan (not nonstick) over medium heat; once heated, add maple (it will bubble and fizz) and hazelnuts. Cook for about 3-5 minutes, stirring continuously until the maple has caramelized. The nuts will feel a little soft, which is fine. Spread parchment paper on a baking sheet, pour out the nuts and spread them out a bit. They will harden as they cool. Store in an airtight jar at room temp for as long as they last which is realistically about five minutes. To make the cake: preheat the oven to 350, and grease an 8″ cast iron skillet with coconut oil. In a large bowl, mash the bananas, then add eggs, melted coconut oil, honey, and vanilla. In a smaller bowl, whisk together almond flour, flaxseed, cinnamon, baking powder and soda, and salt. 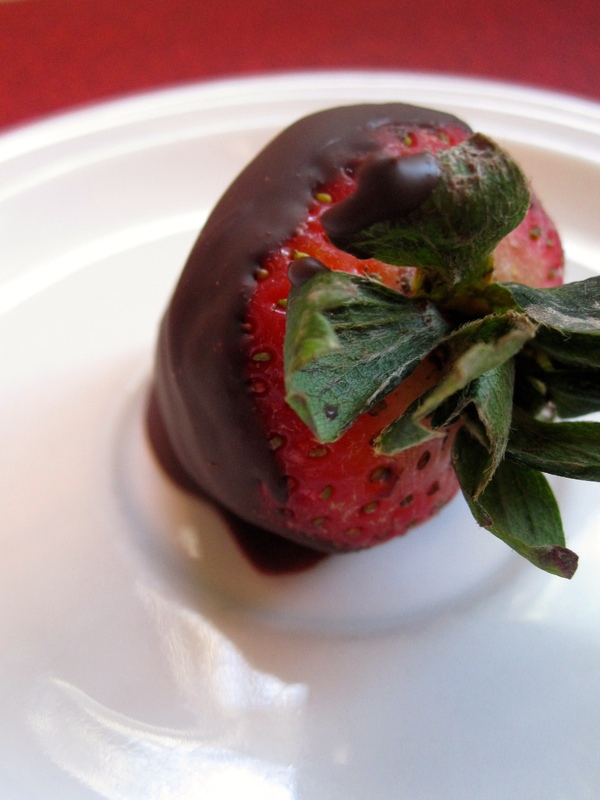 Pour dry into wet, and use an electric mixer to beat until combined. Stir in the chopped dates, and pour the batter into the prepared pan. Bake for 40-45 minutes, until a tester comes out clean and the top springs back when touched. The cake will brown because of the honey – if you feel it’s browning too fast, feel free to cover it with foil. Let cool completely before serving. While the cake is cooling, make the sautéed dates! (good luck not eating them all straight out of the pan). In a small sauté pan, heat the olive oil over medium heat. Once the oil is warm, add the dates and sauté, stirring frequently, until they caramelize and are heated through, just about 2-3 minutes (the edges will start to get a little crispy). Watch them carefully, as they burn easily. When done, move them to a bowl to cool and sprinkle with sea salt (be sure to get all of the good oil out of the pan for drizzling!). Also while the cake is cooling, make the coconut frosting. Open the can of coconut milk rightside up, and scrape out the cream that has solidified at the top, leaving the coconut water at the bottom (save it and use it later!). Scoop the cream out into a bowl, add vanilla and coconut sugar, and use an electric mixer to beat into the consistency of whipped cream. Use immediately, or chill for later use. 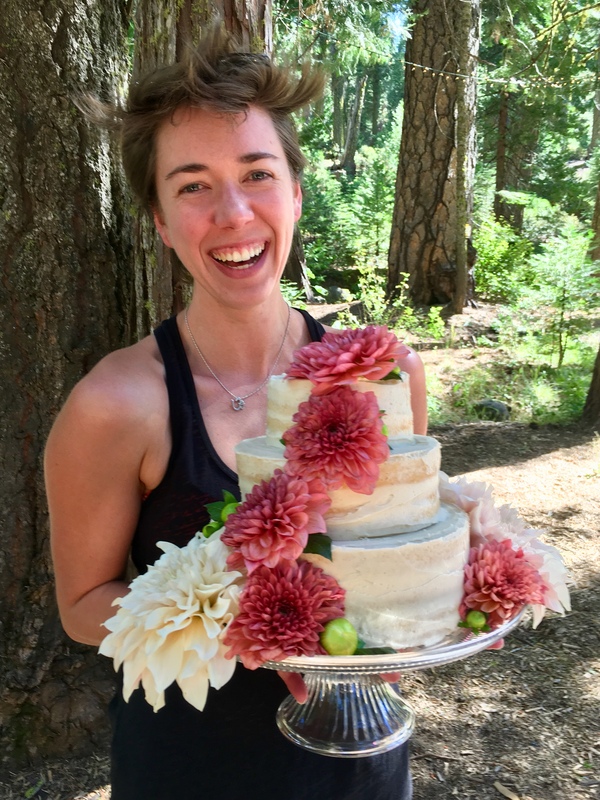 For serving: Frost the cake with the coconut whip (make sure to frost the cake once it’s completely cool! otherwise a melty mess will ensue); top with sautéed dates and maple hazelnuts. Indulge responsibly (i.e., have another piece)! Errrrybody do a happy dance, somehow I’ve actually blogged twice in two weeks! Shocker. But hey, I’ll take what I can get. And I have TWO things for you today! Two completely disparate things, but that’s sort of my jam anyway. ALL THE COLOR!!! I love food. Who says adults can’t play with their food? SO! Dessert and veggies. Two of my favorite things. AND both things are allergen-free, meaning no almonds, coconuts, any of that business (this is interesting, by the way…. 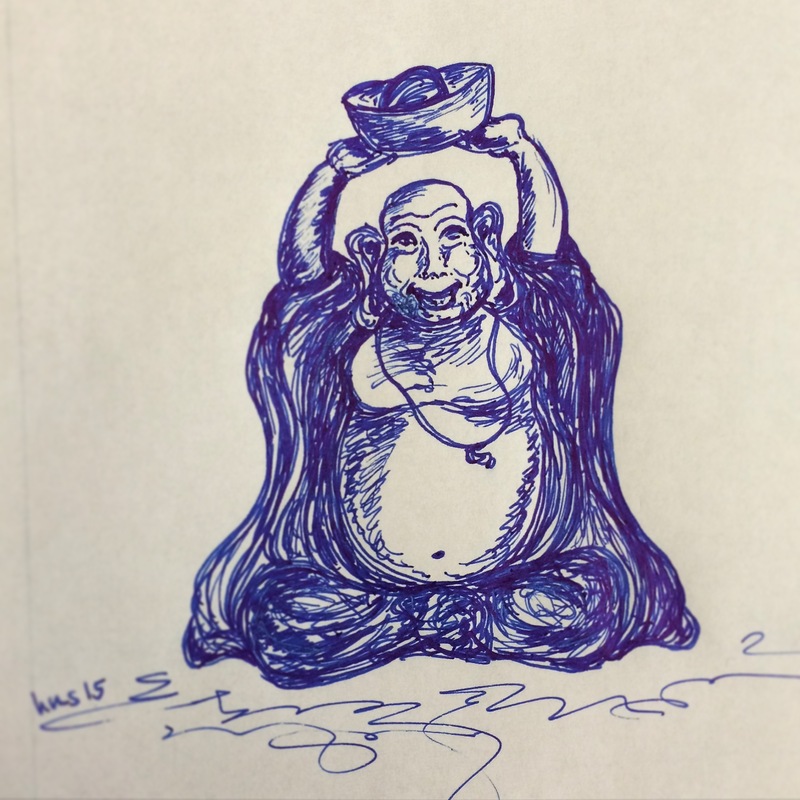 not eating all the things I did before is encouraging my creativity). But I’m not feeling deprived (yet. 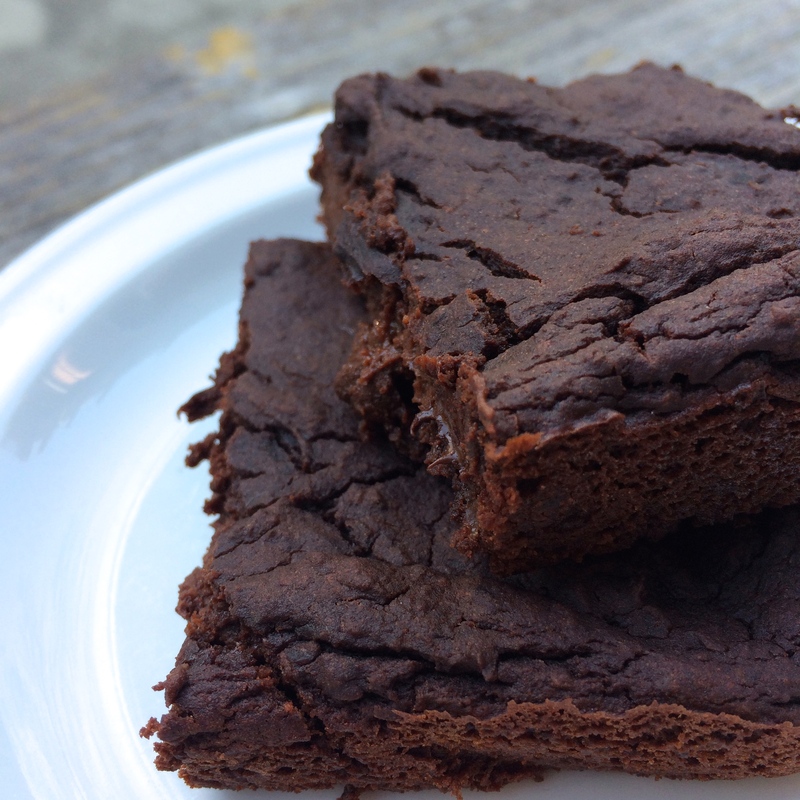 Kinda want some bread up in here), especially because I have these SUPER BOMB brownies in my life. 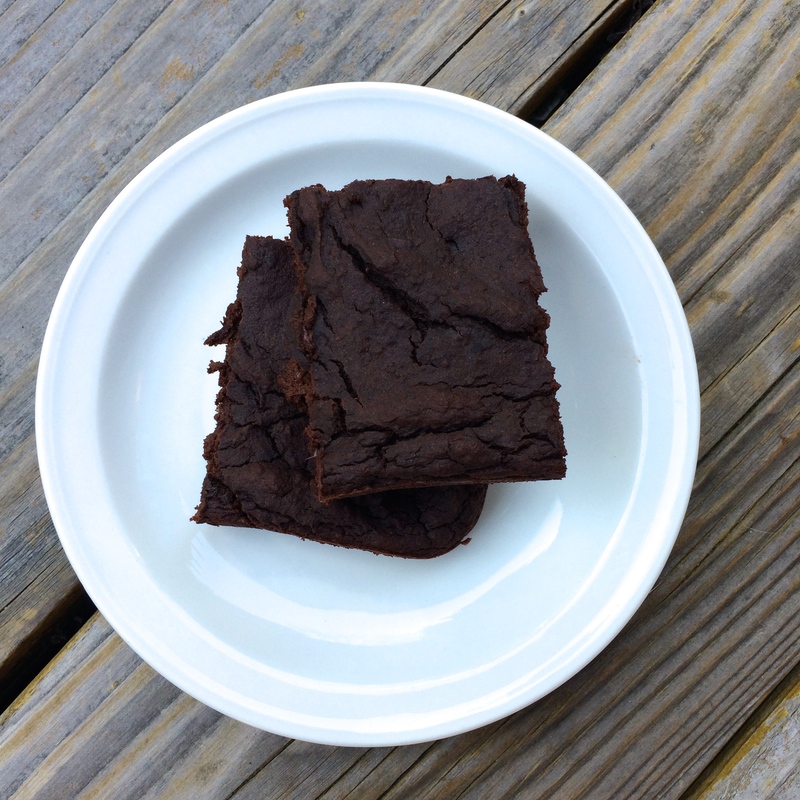 I mean, I’ve made plenty black bean brownies before… but these are my favorite! Completely made of whole foods, vegan, gluten free, grain free, refined sugar free… and they come together in about three seconds in the food processor. Which is basically a win-win in my book. Mmmm. Brownies. I will never ever ever stop loving them. And for the veg portion of things, we have crispy roasted radishes! 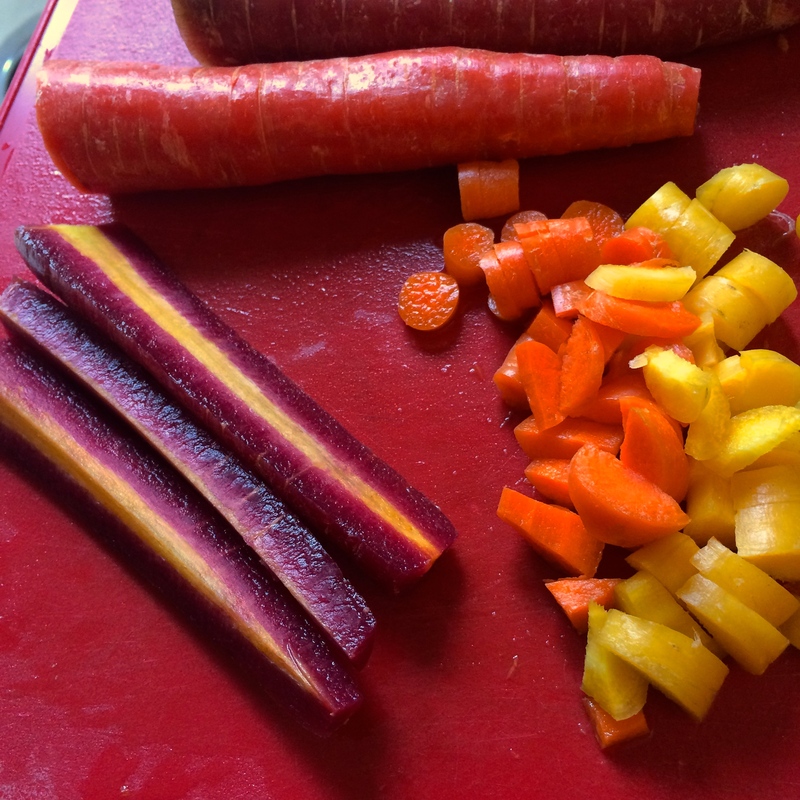 I love radishes raw or cooked, but lately more on the cooked side of things. These get all creamy like a potato since they have a high water content… AND you can use the greens and roast those alongside the radishes, leaving you with some radish green-chips! Sort of like kale chips but way more sassy. 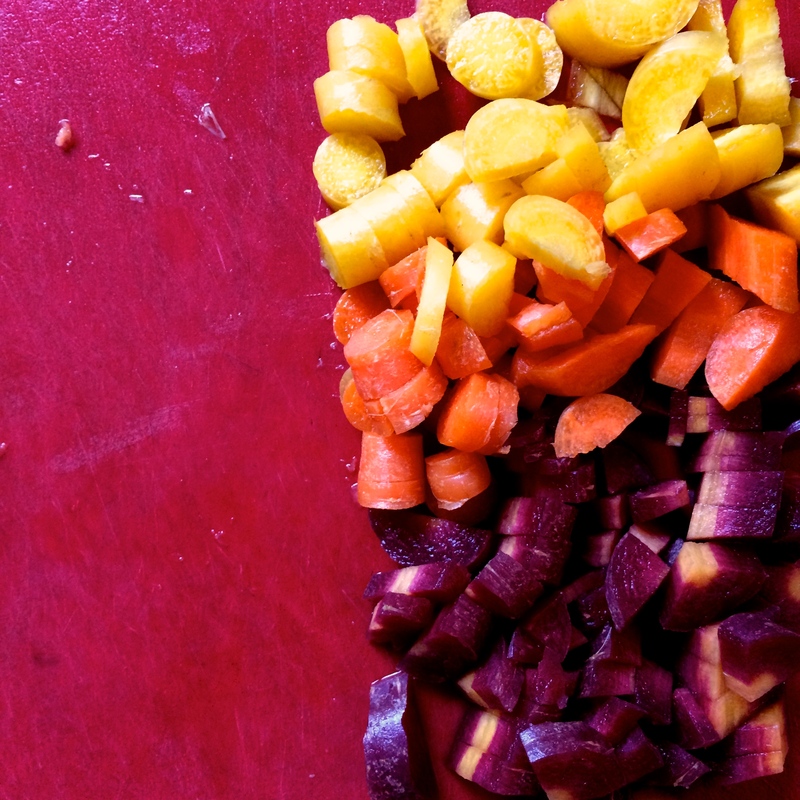 And with that, I leave you with some colorful food and deliciousness. Gluten free, dairy free, grain free, refined sugar free, vegan! Also free of nuts, coconut, and soy. Make sure your chocolate chips are soy free if that’s an issue for you (I like Guittard extra dark, they are soy free and dairy free!). 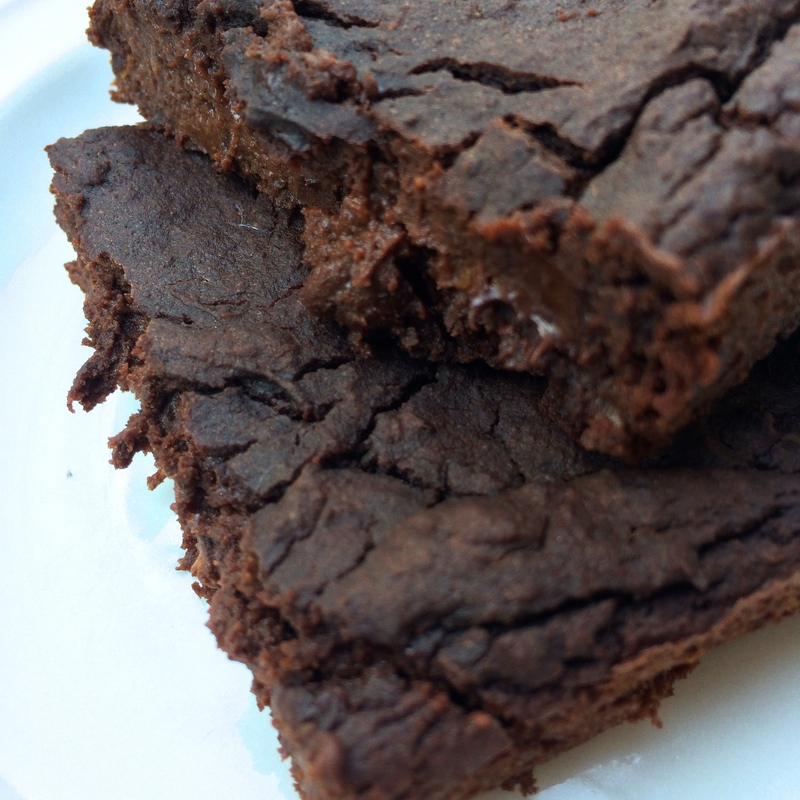 Super fudgy, chocolatey brownies. Don’t worry about the avocado, you won’t taste it! I prefer these cold, straight out of the fridge. Recipe gratefully adapted from Ambitious Kitchen, here! Preheat the oven to 350, and lightly grease an 8 by 8 pan. In the food processor, combine flax egg, black beans, avocado, maple, vanilla, and avocado oil. 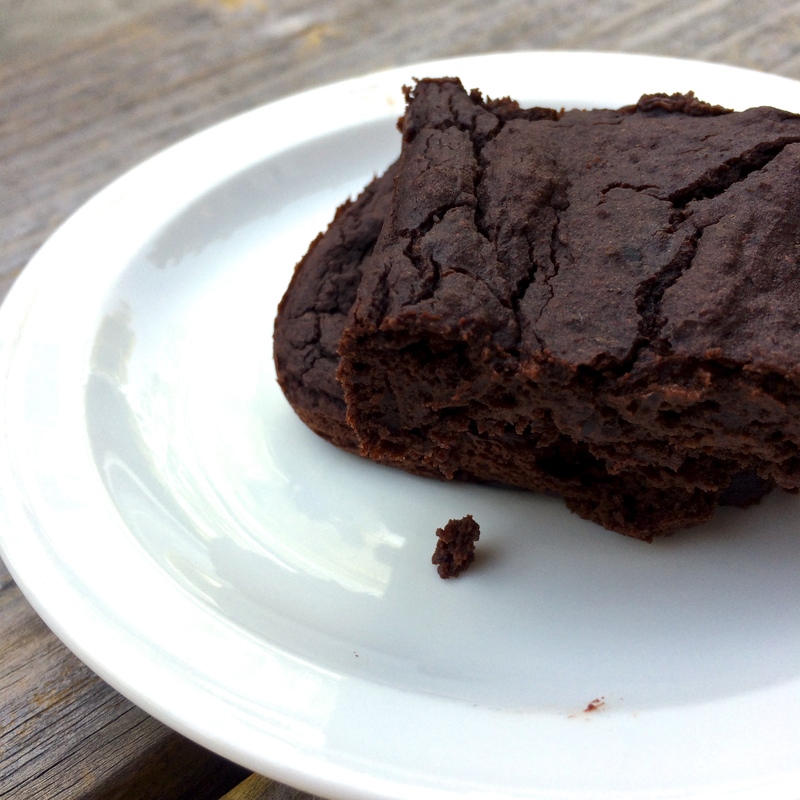 Let it run until combined — I don’t think you especially want whole beans in your brownies… Once everything is smooth, toss in cocoa powder, baking soda, baking powder, and sea salt. Pulse to combine. The batter will be nice and thick. Stir in chocolate chips, and pour the batter into the prepared pan. Smooth the top out with a spatula prior to getting them into the oven. Bake for 27-29 minutes—mine were perfect at 28. The top should be slightly firm, but not hard. Let them cool completely in the pan, then store leftovers in the fridge for a few days (if they even last that long). These are spectacularly creamy and satisfying. The pepperiness of radishes is muted a little, and the texture almost reminds me of potatoes. Gluten free, dairy free, vegan. 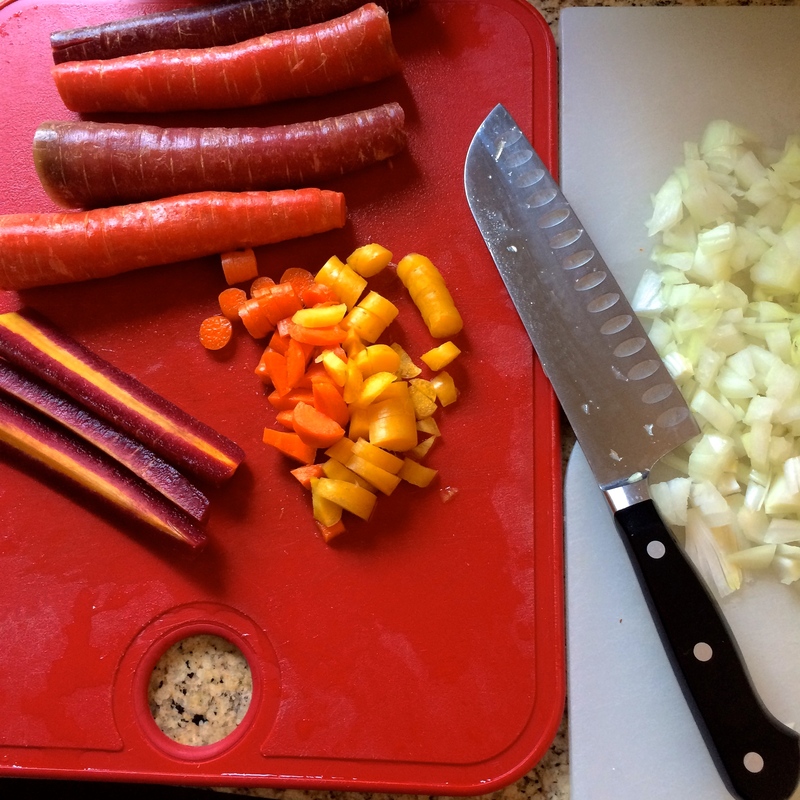 This is really a recipe suggestion — I left mine simple with just salt and pepper, but go nuts! All kinds of different herbs would be delicious on these. 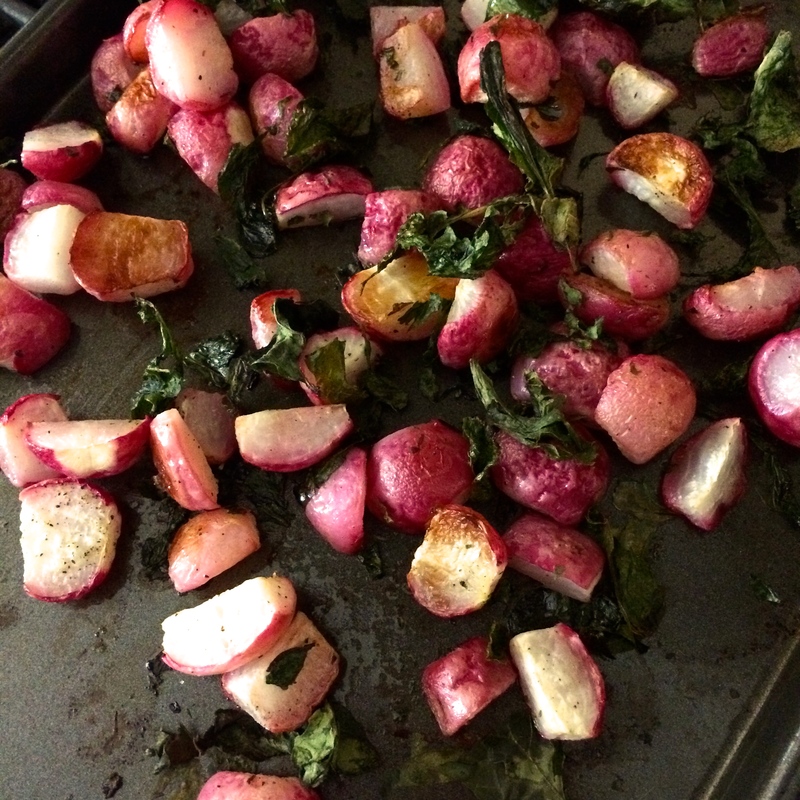 I roast the greens with the radishes as well for a crispy, chip-like complement. Preheat the oven to 400, and procure a smallish sheet pan. 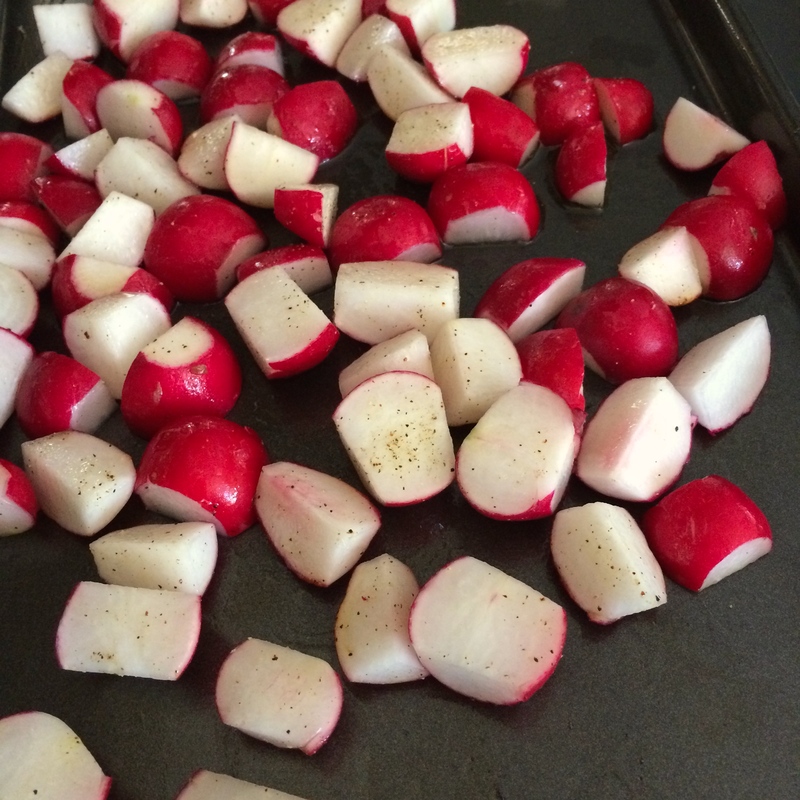 Place halved radishes on the baking sheet, and top with salt and pepper and any other desired spices / herbs. Drizzle olive oil over the top, then use your hands (or a spoon, I guess…. but trust me, it is way more fun with your hands) to toss the radishes around and distribute the oil evenly. Roast for 10 minutes, then add radish greens. Continue roasting for 30 – 35 more minutes, until the radishes are browned and crispy. Serve hot, with salt and pepper to taste. Ugh, here we go again with large hiatuses (hiati-i?!) in between posts. I miss you, invisible internet friends! I do hope things are going swimmingly and that your summer is fab. Defs no complaints on this end, other than a lack of time to blog. Obvs. So then because I’m really like five years old, this happened. Sprinkles make everything taste that much better. But anyway. Back to the real food shenanigans because I’m pretty sure that’s why y’all are here, not to listen to my probably semi-obnoxious rambles about inner fiver year olds. I mean… if you are, though, I could go on… ha. Let’s not. This is the beyond perfect dish for when it’s stupid hot out and you are really dying for pasta for some reason. I don’t know, it could happen! But this recipe involves only one stove burner for only about a minute, so it’s a [nearly] heat free solution. And it’s FULL of fruit and veg so obviously is my favorite thing ever. AND you can put cheese on it. So um… obvi. Clearly this is a perfect dish. 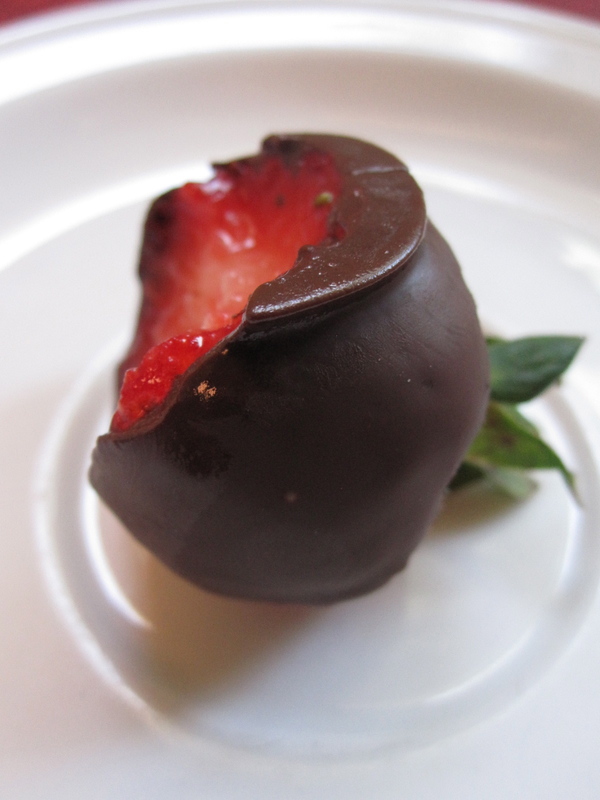 Top it off with some chocolate covered strawberries [extra dark chocolate+coconut oil melted…having dipping fun…let sit in the fridge for a bit] and you can just consider yourself in gastro heaven. Extra points for the addition of ice cream and a boyfriend who really like ice cream too and will therefore indulge you when you NEED IT NOW. Vegan [w/o cheese garnish], gluten free. Serves 2 comfortably, with pesto leftover. Light, perfect for summer and peach season (this is obviously best with fresh ones). Recipe lightly adapted from the Vibrant Table cookbook via Food Loves Writing, here! This was such a near-perfect recipe I felt little urge to change it up. 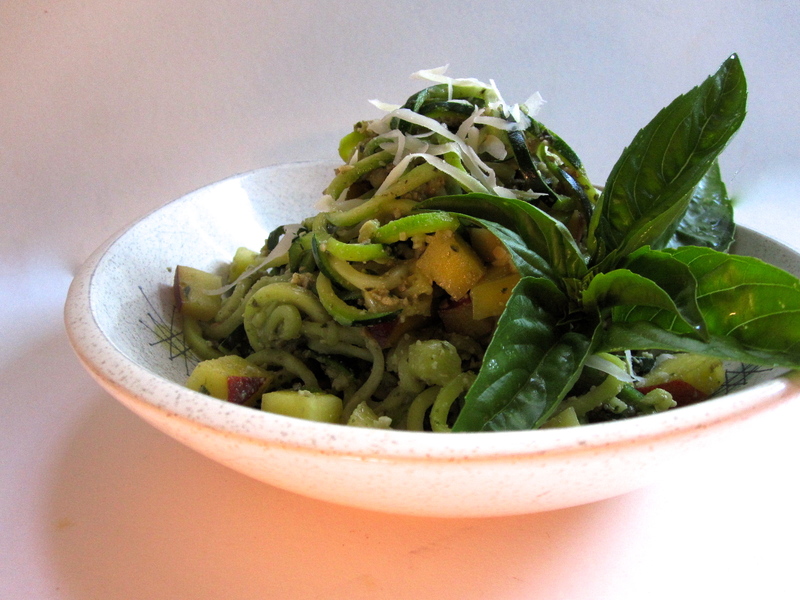 Delicious, fast, and summery. In a saute pan, heat coconut oil over medium heat. Once the pan is heated, toss in pepitas and sea salt and sauté until they start to smell a little toasty, 3-4 minutes (I don’t time them, I just go by smell; if they start popping, take them off the heat!). Pour them onto a plate and let them cool slightly. Blend the pepitas in a food processor until they reach a consistency like almond meal, or like very small breadcrumbs. 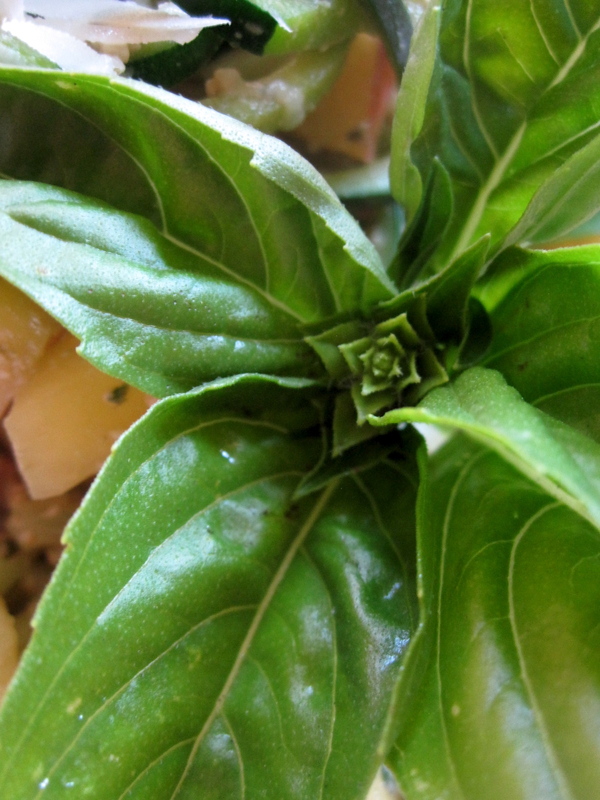 Blend in olive oil, basil, water, lemon juice, and garlic until combined. I like mine thicker and on the chunky side, but if you’d like yours to be thinner, blend in more olive oil or water. 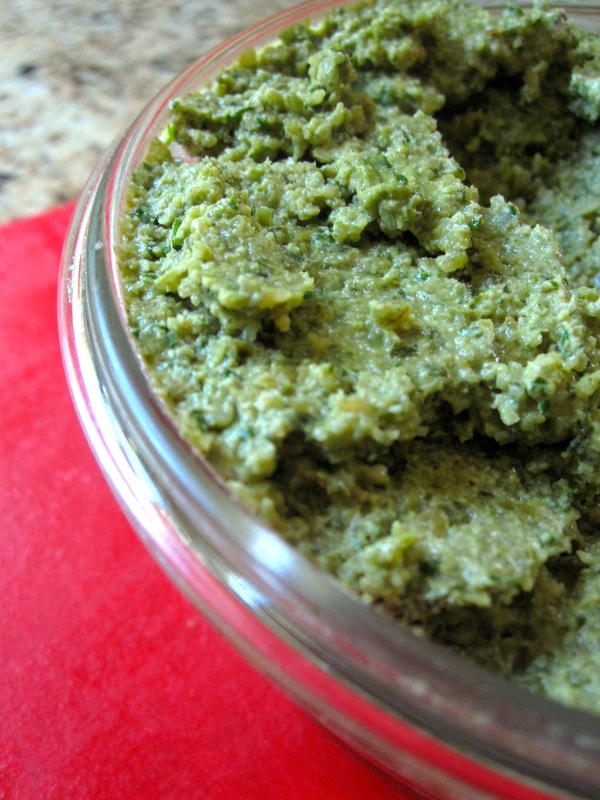 This will make more pesto than you need for two people—refrigerate the leftovers in a lidded glass jar in the fridge. 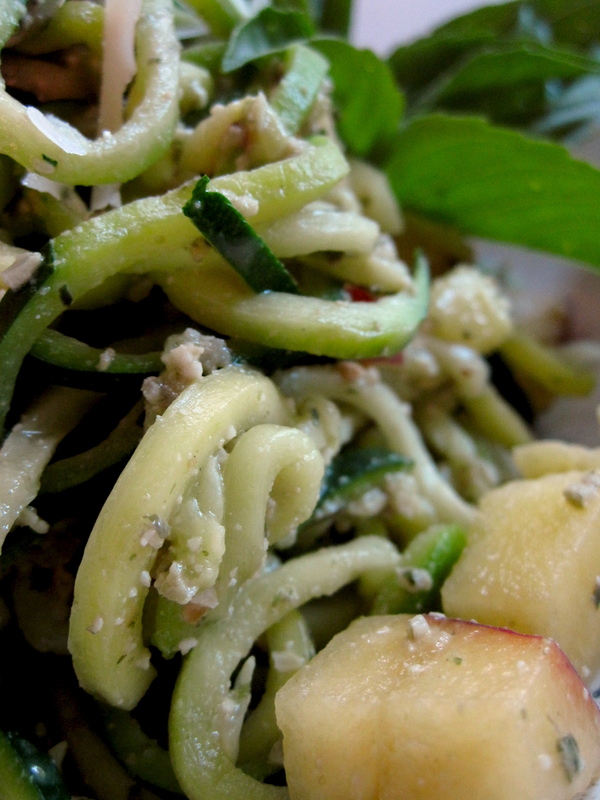 Using a spiralizer, turn the zucchini into noodles! (My favorite part, we’ve already established that I’m pretty much a five year old). 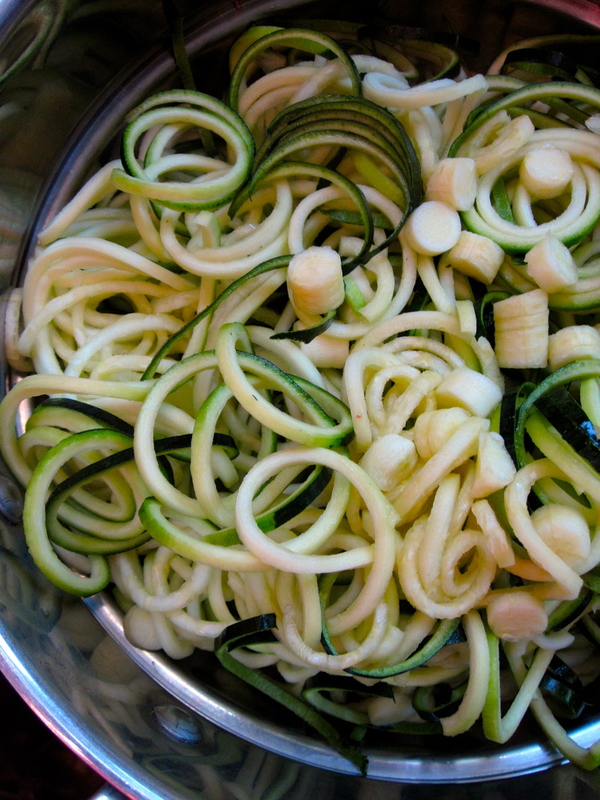 If you don’t own a spiralizer (which I recommend getting, I LOVE mine), you can use a veggie peeler to shave off zucchini noodles instead. 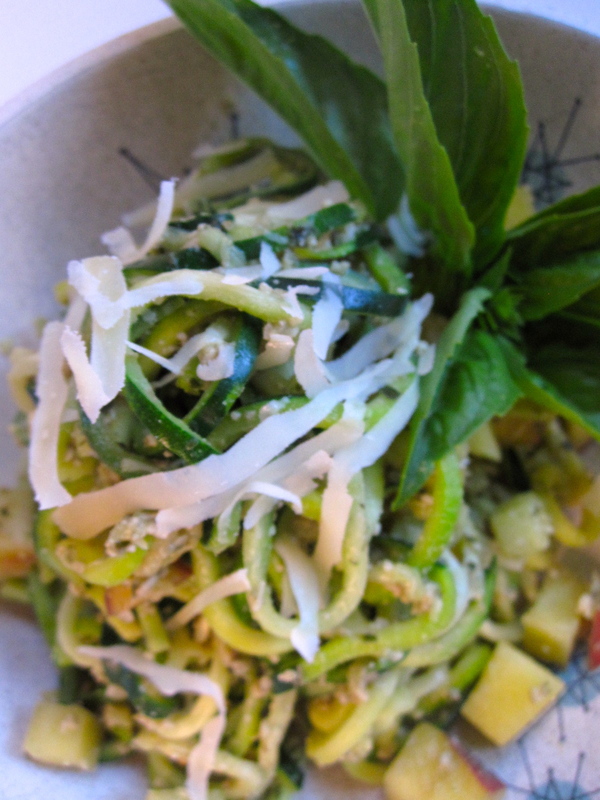 I steam my zucchini noodles for a few minutes until softened but still with a bite to them. 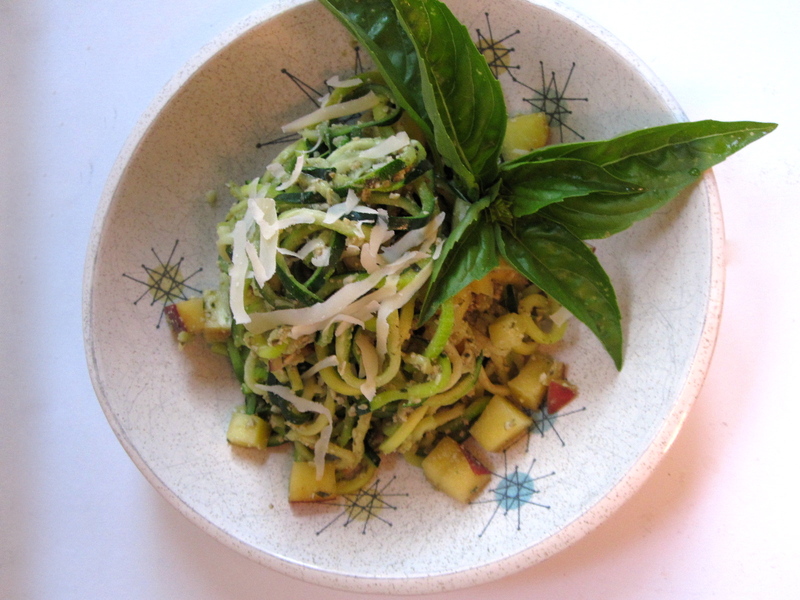 Toss hot noodles with several healthy spoonfuls of pesto, and stir in the diced peaches. I added salt and pepper to taste at this point as well. 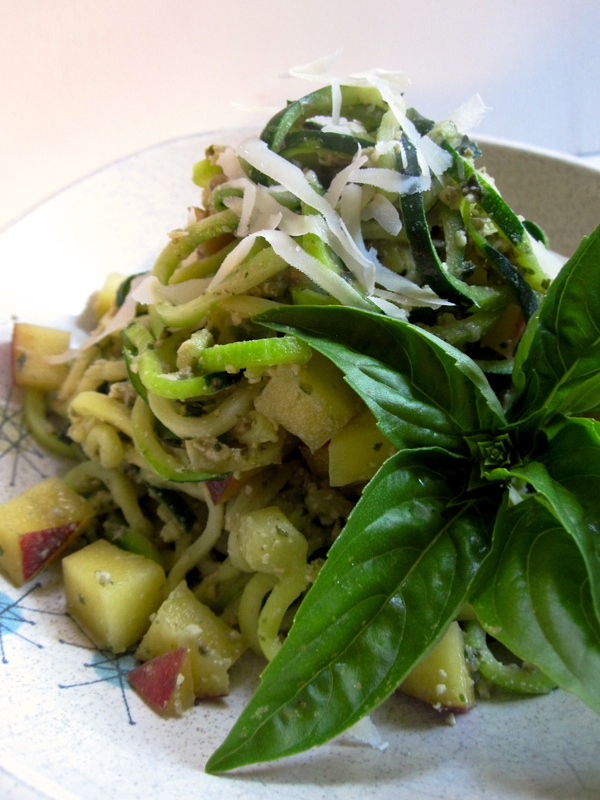 Serve with grated parmesan and fresh basil for garnish!